I am in business to help people. Our country has well over 130 million existing housing units of which over 91 million are single homes, and 10’s of millions more are multi-family, commercial and industrial buildings. Imagine the decades of work and the impact of each one of these buildings achieving energy use performance of HERS Index 30, or lower. I am interested in helping all existing and new buildings achieve Net Zero Energy Building by 2030. Presently Energy Audits are mostly flawed. They are most often done by people looking to do the work the audit says should be done, and the owner gets what the auditor decides to give. Energy Audits using the BPI protocol produce basic knowledge about the existing condition of the building’s thermal envelope, as well as Life Safety and Healthy Home conditions. If you randomly choose ten BPI trained experienced auditor’s and send them to the same home, each one will get approximately the same base knowledge about the home. But when you see their individual recommendations for work to be done, there is a wide variation driven by incentive money available, what work the auditor thinks the owner will agree to do, the auditor’s proclivity to do one type of work over another, and etc. I see this as a problem caused by something missing. What makes auditors arrive at the same base knowledge about a building, and then diverge so wildly? What choices does the owner have in all this, and how is the owner to ferret out a way to express what they want? How many owners pay for more than one energy audit to be able to compare the possible different results? The problem is this, “No one is offering the client a clear Energy Use Goal to be achieved”. Without an Energy Use Goal everyone starts at the same point and then diverges all over the map. Here is what happens now, an energy audit is done, the work is completed to whatever level the auditor decides the owner will pay for, and the energy savings are gobbled up quickly by the increase cost of energy during the next year or three. If the owner wants to do more, then start the whole process all over again. This is wasting talent and opportunity. The missing element in all energy audits is the lack of a clearly defined Energy Use Goal. This lack of an energy use goal is a huge gap in the approach to energy audits today. A clear energy use goal is to be set and all audits must include what is required to achieve this goal. Once a clear energy use goal is set, then everything drops into place. I see a huge opportunity for Raters to serve for a living. Imagine if all energy audits first establish the building’s existing As Is HERS Index number, and second specify a list of all needed work to achieve an Energy Use Goal of Projected HERS Index 30, without solar. This is an exciting pro-active use of the scale called the HERS Index. I am making a business of creating what I call ZEB Audits for clients. A ZEB (Zero Energy Building) Audit combines the BPI audit with the Energy Use Goal of HERS Index 30. I determine where the home/building exists in all things energy related, as well as Life Safety and Healthy Home conditions. Then I establish a list of work steps required to achieve as close to HERS Index 30 for that building as possible, without solar. 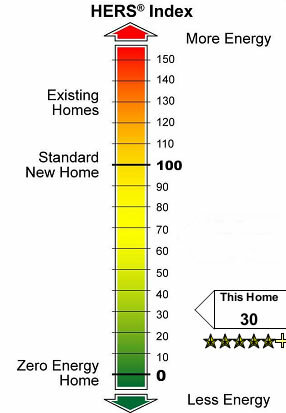 I deliver this list of work specifications to achieve a Life Safe and Healthy Home with an Energy Use performance of near HERS Index 30 to the owner. I and the owner review the list to order it with Life Safety and Healthy Home issues 1st, and then the rest of the list is order to give the best return on investment first to last. Why did I choose HERS Index 30 for ZEB Audits? Because I and others have determined that we can achieve this Energy Use number without solar, while maintaining all desired functions of the home. After achieving HERS Index 30, there is nothing left to do but produce energy on site to replace the energy still being purchased. I see HERS Index 30 as the “tipping point” between the cost of what we can do to reduce energy need and the cost of what we can install to produce energy on site to achieve Zero Energy Building (ZEB) and HERS Index Zero. What does this all mean for owners? People like to know where they are, like to plan to go somewhere, and like to know their plan will take them there as smoothly as possible. Combining Energy Audits with an Energy Use Goal of HERS Index 30 creates a plan/list of specifications that when completed will deliver a defined performance. The HERS Index is the key, a scale by which people can succinctly know where their energy use is now and where they will be when the work is complete. ZEB Audits to achieve HERS Index 30 are simple, clear, and elegantly easy to understand by all. People like simplicity and clarity. Now the work begins with the appropriate trades doing the 1st item on the list, and proceeds through the list for the greatest return on the investment. The list of specified work to achieve HERS Index 30 can be completed all at once, or one item at a time over years. It does not matter how fast or slow an individual owner decides to work through the list, because they always know where they will be once the work list is completed. The owner pays for one audit, gets one plan list to achieve HERS Index 30, and knows where they will be with energy use when the work is completed, regardless of how long they take to complete the work list. The building only needs one plan, the ZEB Audit. This creates “real and permanent good”. John B. Unger Murphy is the owner of Vermont-based Murphy's Cell-Tech and Murphy's Zero Energy Building and a building systems engineer, designer, and installer with over 30 years of experience in the field. As a Building Envelope Specialist, he primary focus is on occupant health and safety, building insulation integrity, air-leakage control, and moisture management. Additionally, he is an instructor on Super-Insulation for Zero-Energy Buildings at the Yestermorrow Design/Build School in Warren, VT. John is also an independent HERS Rater with the BER Rating Providership. This article has been presented as part of BER's Rater Spotlight series, in which BER features articles written by our Rater clients. BER believes strongly in the power of the collective knowledge of our clients, who are all highly trained professionals dedicated to advancing the science, business, and implementation of high performance buildings. If you're already a member of BER, we want to know what you have to say! Email us your ideas for future articles now! If you're not already a member, join the BER today!